Today's travel consumers have access to seemingly unlimited resources in their path to choosing hotels. They draw inspiration from social media, from ads, from word of mouth, from search, and from online travel agencies - to name only a few. Once they have decided where they are headed, they are most likely selecting their accommodations from among tens if not hundreds of traditional hotels and home rentals. How can a hotel possibly stand out in the crowd? 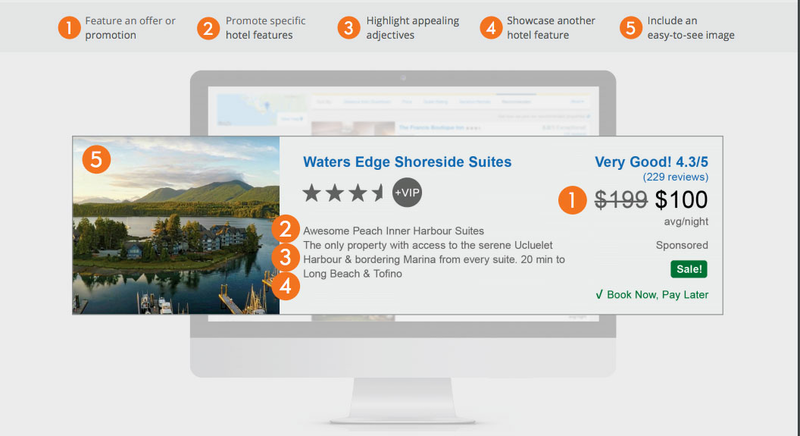 Water's Edge Shoreside Suites customized their sponsored listings to optimize their campaign's impact. The result was a huge increase in room night demand over a short period of time. Along with customizing your hotel listing, another great tactic you can incorporate is tapping into our advanced targeting features. With these features you can reach the most qualified travel audience that brings in the most revenue for your hotel. Fill need dates: Use Scheduled Ads to target your audience based on specific booking and travel windows. Increase revenue with a controlled budget: Set your daily budget and cost-per-click to a number you're comfortable with and adjust at any time. Extend your reach: Reach a truly global travel audience and gain exposure across the network of Expedia Group brands by keeping your country of origin targeting parameters open. Bid Strength: Knowing the strength of your bid relative to your competitors lets you see if you are a market participant, contender, or leader at a glance. This does not guarantee a specific rank but provides you with a realistic picture of where you stand in the bidding marketplace. This information may indicate that one or many aspects of your strategy needs adjusting to be competitive. Room Nights Clicked: Knowing how many room nights have been booked because of a travel shopper clicking on your sponsored listing will help you demonstrate clear return on investment. Room Nights Exposed: Knowing how many room nights have been booked because of travel shoppers seeing your sponsored listing will help you understand the indirect but significant impact of your sponsored listings. Whether you need to increase bookings during low-season or improve your overall market share, TravelAds Sponsored Listings can help you reach your goals. Learn more about how TravelAds Sponsored Listings can help you drive more hotel revenue by contacting us or downloading our . As global senior director for TravelAds, Andy Mann leads business development and sales for Expedia Group Media Solutions growing sponsored listing business. His team works closely with global and regional hotel chains, management companies, agencies and local independent properties. Before joining Expedia Andy was VP of Sales for Lanyon, leading the sales effort for their SMB product offering. Prior to that, he was Senior Director of Sales for LivingSocial Escapes, responsible for leading the North America travel sales team. He started his career as a business owner and consultant in the CPG industry, before embarking on a corporate career with IBM. Andy is a graduate of the University of North Texas and lives in the Dallas area with his family.